One never can know what the consequences of decisions made today may turn out to be in the future. One of the more intriguing aspects of studying history is looking at developments in the present that no one in the past could have imagined would flow from the decisions they made. By way of example, one of the unimagined legacies of the Treaty of Cession in 1867 is the Alaska Native Claims Settlement Act of 1971. The treaty said little about Alaska Natives, only that the “uncivilized tribes” would be subject to whatever laws the United States might in time adopt. Over the course of America’s development, legislators, lawyers and scholars had often considered the aboriginal land rights of America’s indigenous people, but until 1941 there was no definitive statement. In a case involving the Santa Fe Railroad that year, the U.S. Supreme Court declared that Natives in the United States enjoyed aboriginal title to any land they ever utilized and occupied, whether or not they continued to utilize and occupy it, unless that title had been formally extinguished by the Congress. As a matter of fact, much of the land in the contiguous states had been subject to aboriginal title, and virtually all of that title had been extinguished by treaties the government made with Indians. Many, likely most, of those treaties were made under fraudulent circumstances of one kind or another, but that did not change their legal standing. And the treaties extinguished Native land title everywhere except within the limits of the reservations; within the reservations, Native title was held in trust by the United States. After the Civil War, Congress ceased making treaties with Indians. Partly this was punishment for Plains tribes that had allied with the Confederacy during the war. But it also was part of a new “peace plan” for Indians which would evolve within two decades to an aggressive, comprehensive acculturation policy. All Indians were to be forced on to reservations and any question of land title settled in that manner. No treaties were made with Alaska Natives. Because of its change to Alaska’s vast size, lack of detailed knowledge about its interior geography, and the remoteness, Congress put off formal designation or distribution of Alaska land. Though over the years piecemeal legislation addressed some Alaska land questions – creation of the Tongass and Chugach National Forests, Mt. McKinley National Park, Petroleum Reserve No. 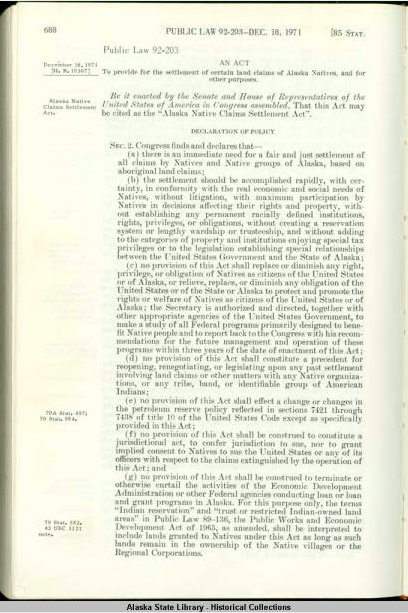 4 and some others – Congress made no general disposition of Alaska lands until the 1970s. So the question of Native land title in Alaska was not resolved. When the statehood act was passed in 1958, the question of Native land title was discussed, but no action taken except to include, at the insistence of the Alaska Native Brotherhood, Section 4, in which the people of Alaska disclaim any right or title to land that might be subject to Native title. No one knew which lands those might be. Unappreciated by most people at the time, Section 4 of the statehood act clashed with Section 6, which granted the State of Alaska 104 million acres of unoccupied and unreserved land. The clash became apparent when the state began to make its land selections and Natives began to protest many of those selections on the grounds that they were subject to Native title. There were so many Native protests to the state’s selections and so much confusion, that in 1966, the Secretary of the Interior stopped all state selections until the Native claims issue was settled. Congress settled it in 1971 with the Alaska Native Claims Settlement Act, which granted Native title to 44 million Alaska acres and extinguished Native title to all the rest, paying compensation to Native corporations for the extinguished title. Had treaty making not stopped in 1871 or had Congress undertaken some settlement of Alaska Native land claims in 1867, it is unlikely Alaska Natives would have been granted the land they have today or that the Native development corporations would exist. But no one could have imagined such things in 1867. McMillen, Christian W. Making Indian Law: The Hualapai Case and the Birth of Ethnohistory. New Haven: Yale University Press, 2007. Mitchell, Donald Craig. 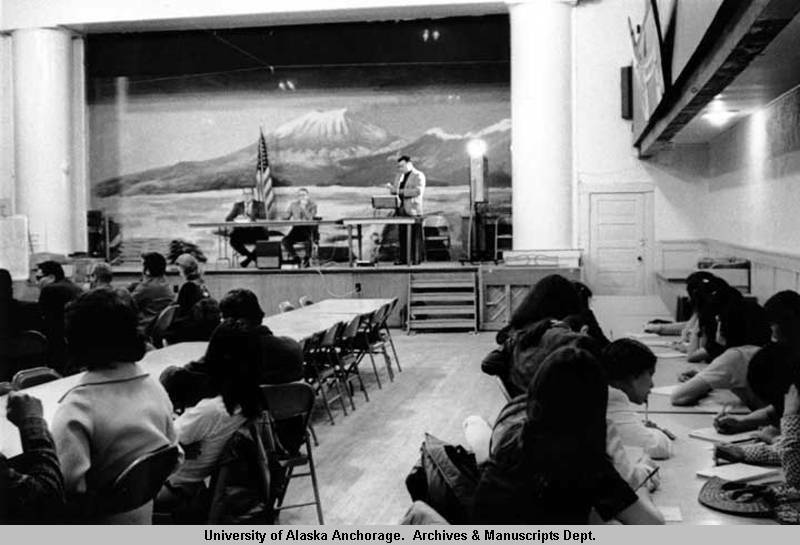 Sold American: The Story of Alaska Natives and Their Land, 1867-1959. Hanover: Dartmouth College, 1997.